The book discuss the fundamental beliefs and practices of Islam with a view to enabling people of other religions to study the principles of Islam and to understand the similarities of ideologies between religions. In simple language, it deals with the concept of a prophet, the life of the Islamic prophet Muhammad, the contents of the holy text of the Muslims, the Quran, the main pillars of Islam, the history of Islam practice of Islamic law. Along with the political, legal and social framework of Islam, it explores facets of Islamic mysticism – Sufism – examining its major features like asceticism, knowledge of God and love of God. It finally looks into the basis for a dialogue between the Hindus and Muslims by delving into Quranic Verses that stress the plurality of religious traditions and the fact o diversity begin universal. The work will prove thought-provoking and immensely significant in the present time for readers in general. Arvind Sharma, formerly of the I.A.S., is the Birks Professor of comparative Religion in the Faculty of Religious Studies at McGill University in Montreal, Canada. He has published extensively engaged in promoting the adoption of Universal Declaration of Human Rights by the World’s Religions. He was the co-convenor of the congress on World’s Religions After September 11: An Asian Perspective, which met in Jamia Millia Islamia in New Delhi in January 2009. This book aims to provide basic knowledge about Islam to Hindus. Such a book, however, could achieve its goal in many different ways. I would therefore like to explain to the reader the reasons underlying the form it has assumed, before the reader embarks on its study. 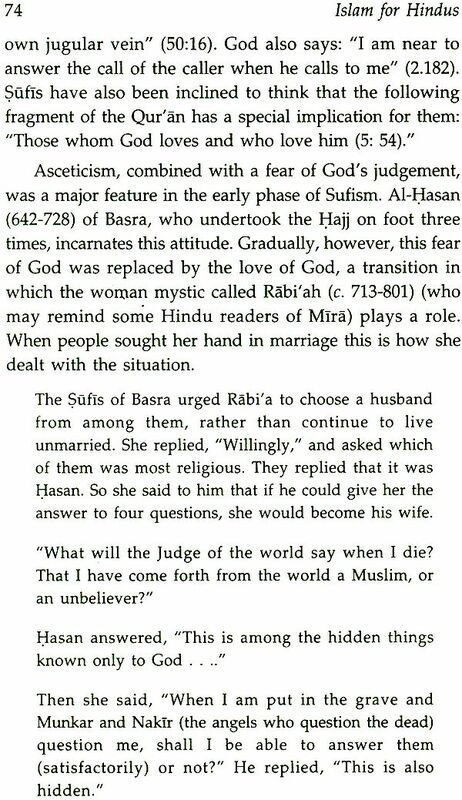 The interaction between Hinduism and Islam on the Indian subcontinent has often, though not always, been a vexed one in many ways. The two religions have therefore tended to view each other through such a lens. This has meant that the understanding each has of the other is often emotionally charged, and that charge has been often negative. And because of this emotional overload, the knowledge each religious tradition possesses of the other has tended to be judgemental rather than factual. 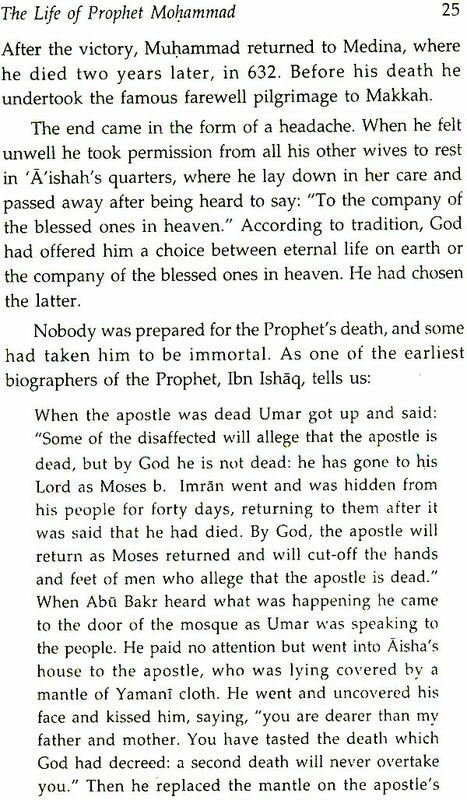 With this in mind, this book is an attempt to provide a factual introduction to Islam in general. I use the expression "in general" advisedly, as this is not a book about Islam in India, although it is in India that ninety-five per cent of the Hindus of the world reside. It is intended to introduce the Hindu reader to Islam in general, under such rubrics as the concept of the prophet, the life of the Prophet Muhammad, the Qur'an, the Pillars of Islam, Islamic Law, the history of Islam, and Islamic mysticism. A final chapter focuses on the question: Can Muslims talk to Hindus? 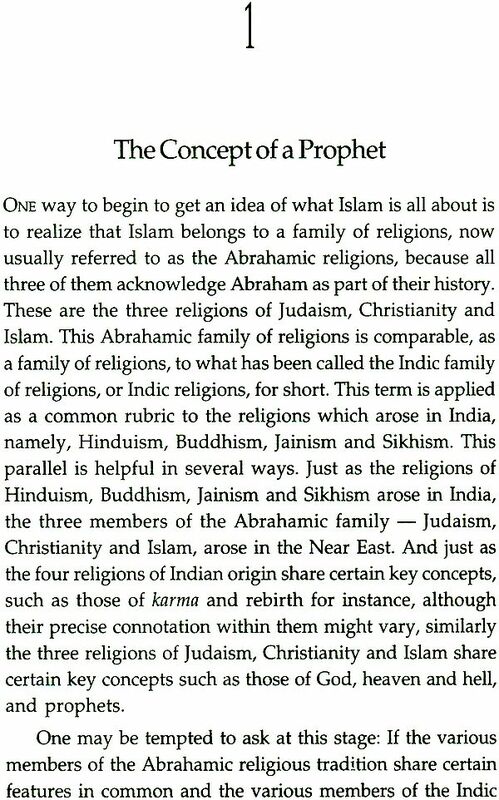 Readers might well wonder why Islam has been presented here in such a decontextualized way, in a manner one might find it presented in a book on world religions, rather than as it might be presented in a book on the religions of India, or in a book on Indian history. There is a reason underlying this mode of presentation and that reason is that one factor, which often complicates the interaction between these two religions, is sheer mutual ignorance. Most Hindus in India do not seem to know much about Islam, as a religious tradition, on its own, just as Muslims in India probably do not know much about the Hindu religious tradition on its own. 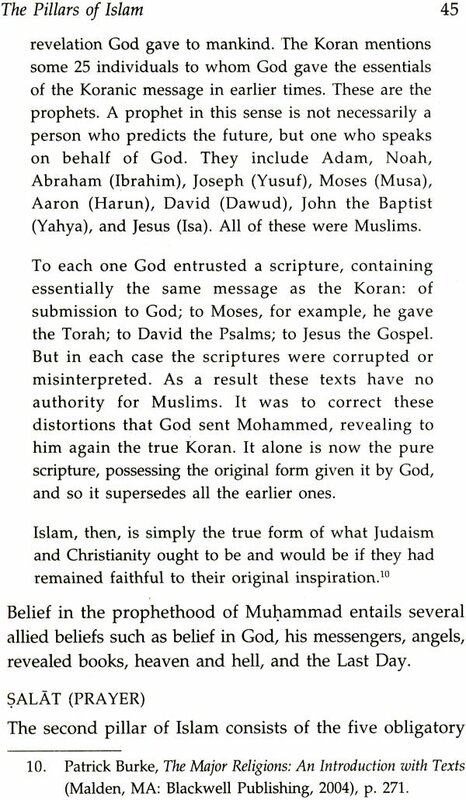 Each religion rather knows the other as it has historically encountered it. The historical issues, arising out of this encounter, have moulded the mutual perception of these traditions to such an extent that it almost seems to require an act of intellectual will to be able to see these religious traditions as a whole, each in its own context. This book is therefore an attempt to go beyond - or to transcend, if you will - such mutual historical conditioning. It is not the implication of such a "non- historical" approach that history is not important, or that historical issues, which have arisen as a result of the encounter between the two traditions, may be pushed under the carpet and not be looked in the face. Far from it. The belief underlying such a book, however, is that the understanding of a tradition generated by an encounter with it may not tell us all that is worth knowing about it. After all, if we know a tradition only in terms of our encounter with it, then we know it only in terms of that encounter, and not as a whole. The holistic knowledge gained through the kind of exercise represented by the book, which presents a tradition outside the context in which it was encountered, may also allow us to form a more nuanced judgement about the nature of our historical encounter with it. It may also enable us to respond to the historical issues, which may have arisen out of the historical encounter, in ways which may not otherwise be possible. It is true that this distinction between the "history" of a religion and its "nature," as it were, has its limits and can be overdone, but this distinction seems to have been hardly invoked in the present context. 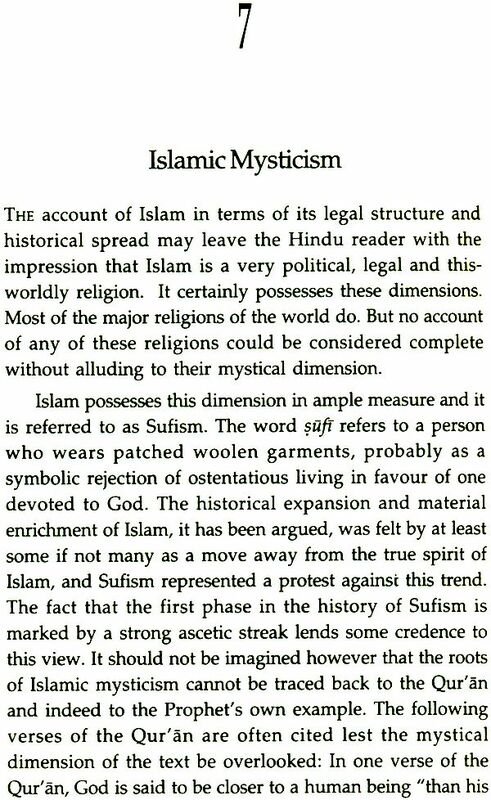 I have therefore taken the liberty of offering here a historically aseptic presentation of Islam so far as the Indian subcontinent is concerned, and also of directing attention to those elements of the Hindu tradition which might provide a parallel to the aspect of Islam under study, when the two traditions are viewed as independent religious systems. These comparisons are, however, highly tentative in nature and are offered as suggestions rather than conclusions, for I would like to emphasize that one might, before offering them as conclusions, wish to acquaint oneself with the religious traditions as a whole, as fully as possible, a condition I cannot claim to meet in the present state of my knowledge or ignorance. Allow me, however, to offer two examples of how studying the two traditions on their own turfs as it were, might enhance our understanding of these traditions, before one takes on the more delicate task of instituting comparisons between the two as I might have rashly done. Both these examples are potentially contentious but I have chosen them deliberately to compensate, as it were, for the straightforward nature of the account which is to follow. The aspect of Hinduism which Muslims recognize immediately, speaking historically, is its hierarchical social structure, often associated with the word jati. When viewed in a holistic perspective, however, it might be susceptible to a more mellowed understanding. Many observers of the Indian scene, beginning with the earliest, both indigenous and foreign, remark on the plurality and diversity which characterizes what we now call Hinduism from its very inception, whenever we might locate it. The existence of such plurality and diversity immediately creates the problem of managing it. In other words, the main problem which Hinduism has had to grapple with, as a religious system in the face of the bewildering variety it plays host to, is order. Now one of the simplest, and also perhaps the most common way, of achieving order is hierarchy, as an antidote to anarchy. 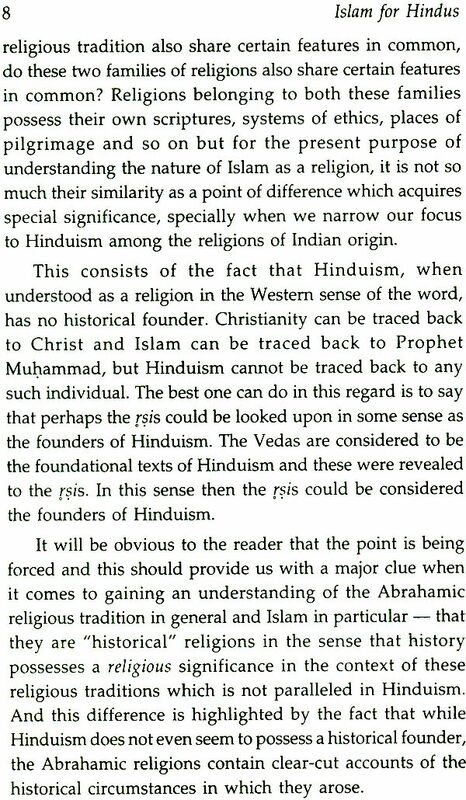 Could this not explain Hinduism's tendency to hierarchize? This also sheds light on the question of justice within Hinduism, in the context of the inegalitarianism which often accompanies such hierarchy, especially when it gets frozen. It is not that Hinduism is indifferent to justice; what complicates the situation is the fact that while order without justice is possible, justice without order is impossible. So before Hinduism can turn to justice, it must tackle the question of order. If this fact is kept in mind, then the proclivity to hierarchy within Hinduism can be viewed as a systemic rather than an arbitrary or perverse phenomenon. This again does not mean that the problems this need for order creates should or can be ignored or overlooked; what such a holistic view does is to enhance our appreciation of the issue in a way as might facilitate its resolution. An aspect of Islam which Hindus recognize immediately, speaking historically, is militancy, often associated with the word jihad. When viewed from a holistic perspective, however, it too might be susceptible to a more mellowed understanding. In the case of some religions, state- formation is not simultaneous with their appearance. Hinduism itself had many years, indeed centuries, of existence behind it, before the Mauryans (preceded by the Nandas) set about establishing the first Indian historical empire in India in fourth century BCE. Even earlier, the clear differentiation between the roles of the brahmana and the ksatriya may have militated against the kind of centralization required for state and empire building. The case of Christianity is even less ambiguous. Not only does Jesus famously ask one to render unto Caesar what is Caesar's and God what is God's, the Roman state in fact was first opposed to Christianity, before the relationship got reversed under Constantine. The Roman state ran parallel to Christianity rather than Christianity coinciding with its emergence, and Christianity gained access to political power centuries after its appearance as a religion. In the case of Islam, however, the emergence of the state in Arabia was coeval with the emergence of Islam. It may not be inappropriate to invoke the metaphor of Siamese twins in this context at this point, if it is insisted upon that other religions may also have enjoyed a symbiotic relationship with the state at times. Now according to most anthropologists and historians, state formation, whether it be in small scale or large scale societies, is hardly ever a pretty affair, and often a sanguinary one. 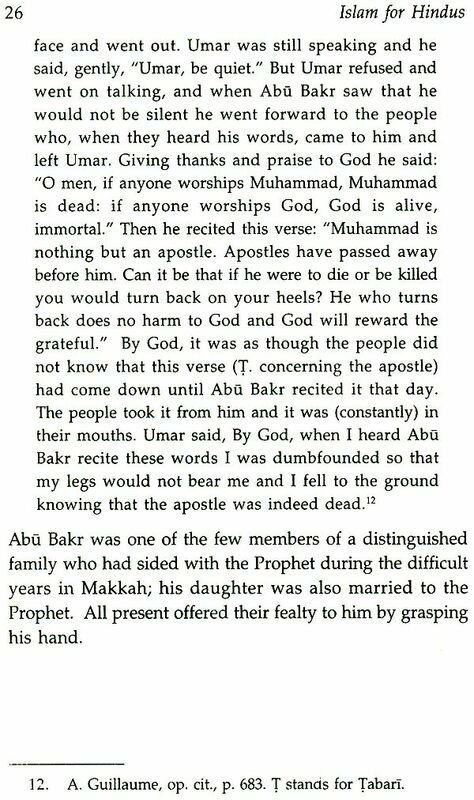 If this is kept in mind, then the problems that might be caused by such a fusion of religion and politics in Islam begin to appear as something systemic and not arbitrary or perverse. This does not mean that the problems such as intimate association gives rise to may be ignored or overlooked, but what it does mean is that one can now take an analytical as distinguished from a stereotypical view of the matter. 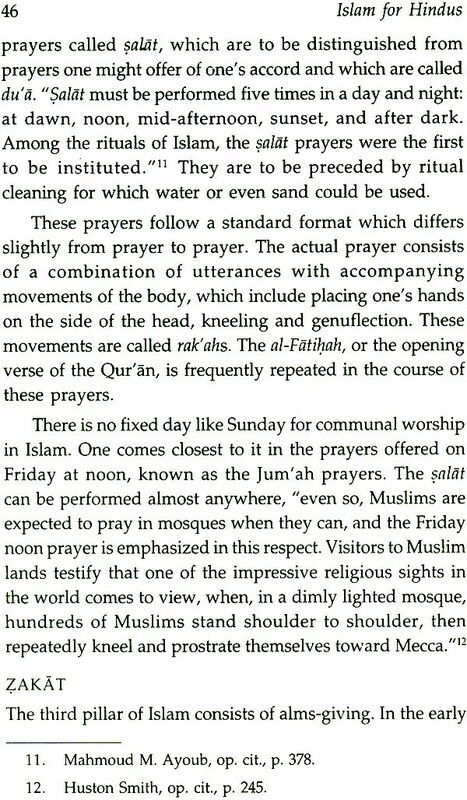 Such an approach, in one sense analytical and in another holistic, enhances our appreciation of the situation in such a way as might be more conducive to the resolution of the issues created by the fact of the natal intimacy of state and religion in Islam. It is my hope, nurtured by the spirit which animates these two examples, that the portrait of Islam, as presented in the pages that follow, will contribute to a more nuanced and holistic understanding of Islam as a religious phenomenon on the part of the reader. I would also like the readers to draw my attention to any errors that may have crept into my account of Islam, as my interest in the subject far exceeds my knowledge of it.